Bellator 202: Budd vs. Nogueira went down last night (July 13, 2018) at WinStar World Casino and Resort in Thackerville, Oklahoma. In the main headliner, Julia Budd (11-2) successfully defended her featherweight title after beating undefeated BJJ world champion Talita Nogueira (7-0) via third-round TKO. 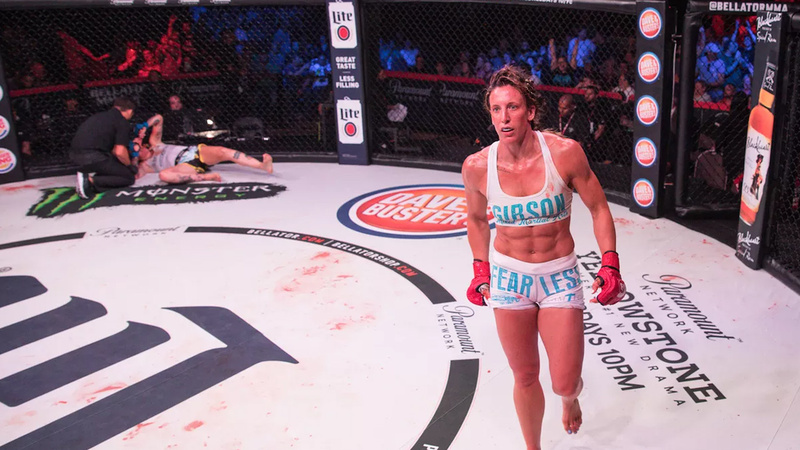 Budd is now on a ten-fight winning streak and in her post-fight speech, she called out the Sinead Kavanagh. In the co-main event, Bellator newcomer Michael McDonald defeated former Bantamweight champion Eduardo Dantas via first-round TKO. Mcdonald dropped Dantas with the right hand, followed him on the ground, and went crazy, with referee came in to stop the fight. Julia Budd def. Talita Nogueira via TKO at 4:07 of Round 3. Michael McDonald def. Eduardo Dantas via TKO at :58 of Round 1. Chris Honeycutt def. Leo Leite via unanimous decision (30-25, 30-25, 30-25). Chris put on a an impressive performance against Leo, uses knees from the clinch to secure the decision victory. Valentin Moldavsky def. Ernest James via TKO at 4:03 of Round 2. Will Morris def. Charles Williams via unanimous decision (30-25, 30-27, 30-36). Veta Arteaga def. Emily Ducote via unanimous decision (30-27, 30-27, 30-27). Yaroslov Amosov def. Gerald Harris via unanimous decision (30-26, 30-27, 30-27). Steve Kozola def. Ryan Walker via TKO at 1:45 of Round 1. Rudy Schaffroth def. Jon Hill via TKO at :42 of Round 1. Tyler Ingram def. Fernando Gonzalez via submission (rear-naked choke) 4:13 of Round 2. Nation Gibrick def. Luis Erives via submission (heel hook) at 1:30 of Round 1.